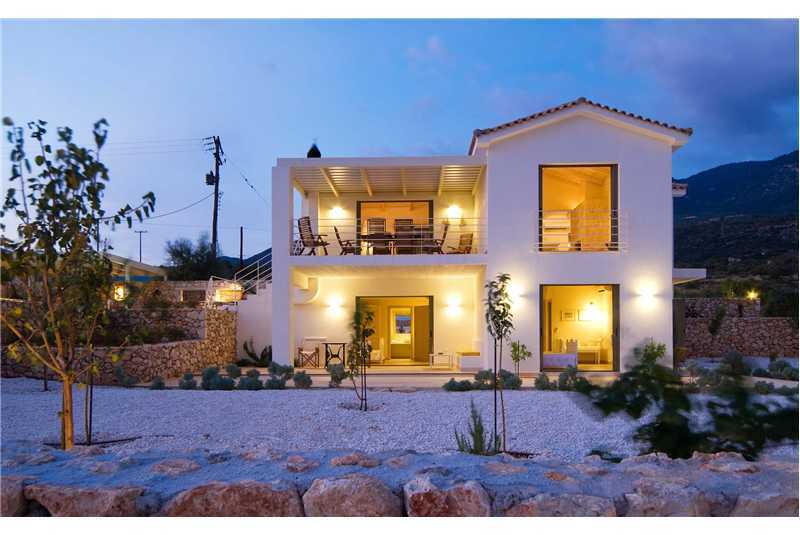 Villa Linatela is part of a secure gated community of eleven private villas close to the small village of Mousata, in an area more commonly known as Trapezaki. There are two tavernas, a mini market and a bakery close by and the beaches of Kanali and Trapezaki are less than 2kms.The village of Lourdas is less than 10 minutes drive, where several excellent tavernas overlook the shingle/sand beach and for the more adventurous, you can hire speed boats to explore the beautiful southern coast of Kefalonia. A twenty minute drive will take you to the capital of the island, Argostoli, here you will find an attractive main square, a pretty harbour promenade, lots of cafes and restaurants, the largest supermarkets on the island, fish mongers selling today catch and the best fresh fruit and veg on Kefalonia. 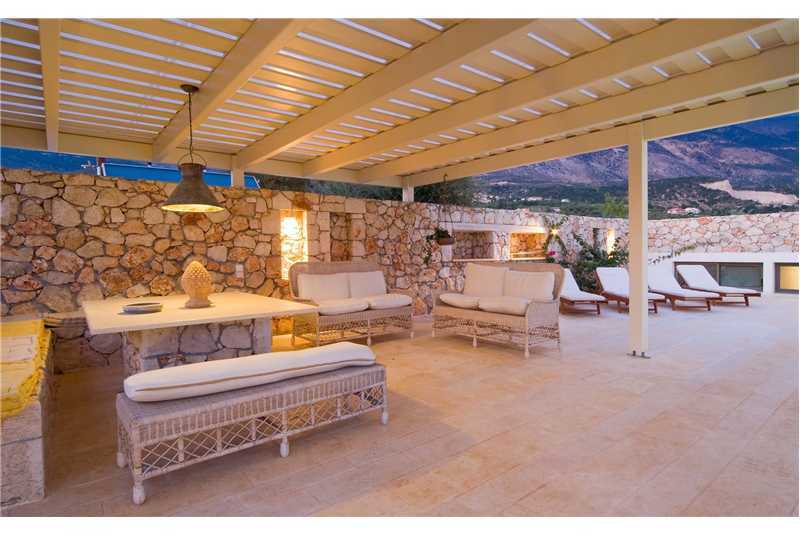 Set in landscaped gardens and enclosed by traditional stone walls, Villa Linatela is a magnificent four bedroom villa with wonderful views over Trapezaki and the Ionian Sea. The entrance to the villa is on the first floor which leads into a spacious dining room with feature stone walls hand crafted by a master stonemason and high vaulted wooden ceilings. The dining room opens onto the living room with a feature stone fireplace and sliding double doors with stunning sea views. The modern fully equipped kitchen opens onto a large balcony furnished with an outdoor dining table and chairs where in the evenings you can eat al fresco whilst enjoying the views under the wooden pergola covering the balcony. A marble staircase leads down to the ground floor to the sleeping area. The master bedroom has its own private sitting room, en suite bathroom and sliding double doors opening onto a shaded patio area with garden furniture. Two further bedrooms, a twin and a double both with en suite bathrooms also have access out onto the shaded garden patio with outdoor seating. The fourth bedroom does not have access out onto the garden, but is a twin with en suite bathroom. A set of seven steps lead down from the kitchen back door onto the main outdoor living area with a large swimming pool with stunning sea views, a sun bathing patio with wooden sun loungers, a built in barbecue and a superb al fresco dining/seating area under a large wooden pergola with feature lighting built into the stone walls. Ground floor master double bedroom with private sitting room, en suite bathroom and doors opening out onto a shaded patio with garden furniture. Ground floor double bedroom with en suite bathroom and access to garden patio. Ground floor twin bedroom with en suite bathroom and access onto garden patio. Ground floor twin bedroom with en suite bathroom. Fully equipped kitchen with fridge freezer, microwave, washing machine, dishwasher and access onto a balcony with al fresco dining table and chairs.